We looked at the lead up to the Revolutionary War. 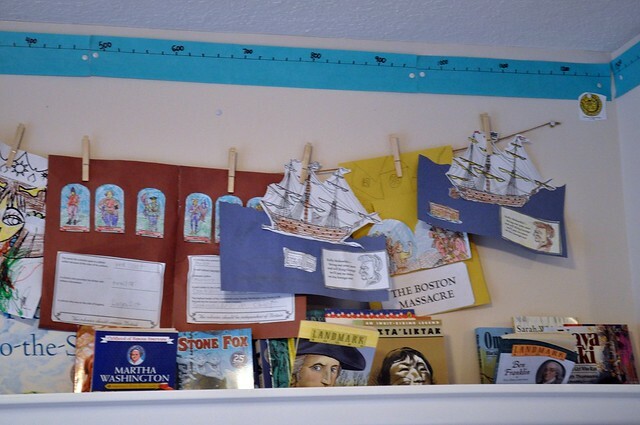 We learned about the Stamp Act, Boston Massacre and the Boston Tea Party. We also learned about Paul Revere. The boys writing coherent paragraphs. I wrote a topic sentence and they wrote several sentences to go with it. We did this several times this week. Caleb started his own story and also began keeping track of God's gifts to us. We finally finished Johnny Tremain The boys really liked this book, even though they thought it was a bit long. They learned a lot about the issues leading up the the Revolutionary War from this book. We used History Pockets: Colonial America, Grades 4-6+ for the first time to add some hands on into our day. Caleb loved doing them! Josiah wasn't as excited. We had a Poetry Tea! 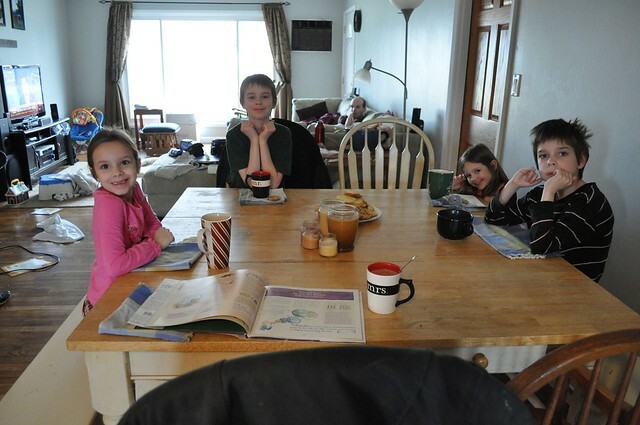 I haven't been keeping up well with our poetry readings, so we read several weeks worth together while we had cookies and hot chocolate. 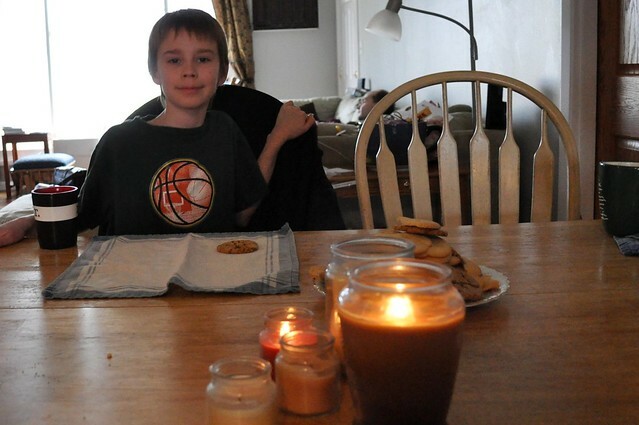 The kids even lit candles. They all really liked this (probably because of the cookies and hot chocolate) and we'll definitely be doing it again. Josiah even asked if we could do it again tomorrow! 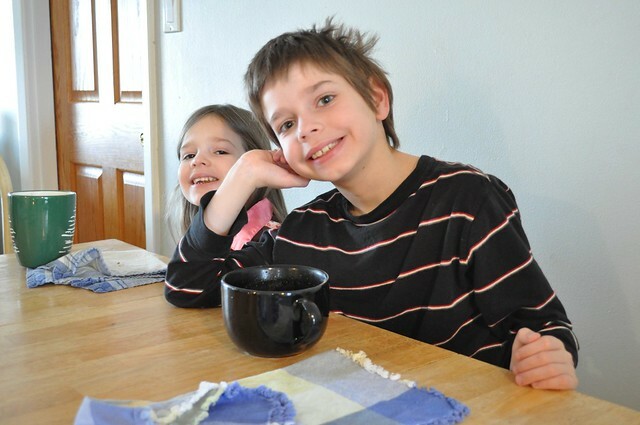 Josiah had a really good week in Math and Grammar. I worked side by side with him and even did part of the writing for him, which seemed to help him a lot. Rachel continued working on her subtraction and addition this week and started Math-It on Monday to work on her facts. Caleb continued his work with fractions and seems to be understanding them well. Jada did a few pages in Explode the code and read some Bob books. Sarah got into constant trouble and watched LeapFrog: Letter Factory for the first time. I just love that movie! It's taught all of my kids their letter sounds so painlessly. I feel like I'm forgetting something, but my mind is a bit fuzzy so this will have to do! I love the poetry review. I think i'm going to have one once a week. Great idea!! Oh, Shannon, I loved reading this. You are doing a wonderful job. God bless you! And try to get some more rest!!!! 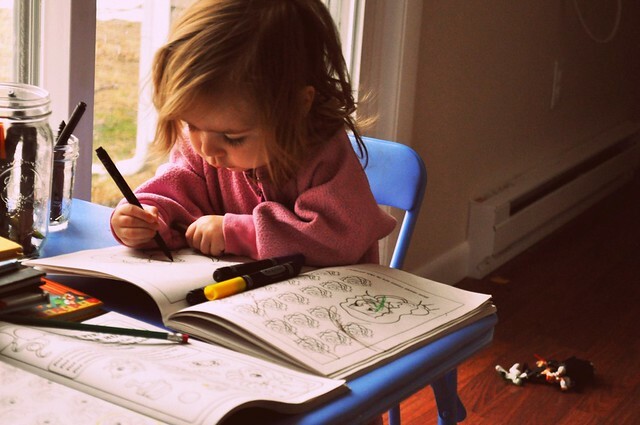 Oh my goodness, your little one with the marker and workbook is JUST the cutest thing ever! I so remember the fog of exhaustion. Wishing you a more sleep-filled week! Another person wishing you more sleep this week! However, even with exhaustion your week looks wonderful. I really liked the poetry tea!